One day Ellen was combing her hair in the bathroom of her simple house. She was glad to live in a house that was clean and comfortable. Ellen knew that some girls her age lived in houses that were not as nice as hers. She had also seen pictures of girls in other parts of the world that didn’t have running water in their homes. She wondered where they washed and combed their hair. Did they do it outside? Did they use a simple bowl of water to wash their face and hands? When Ellen thought about that, she was glad to have her simple little home with a simple little bathroom. But Ellen also knew that other girls had larger houses than hers with beautiful kitchens and large bathrooms with beautiful sinks, spacious bath tubs and shiny lights and fixtures. Sometimes Ellen wished that her family could have a beautiful home like that, but then she felt a little guilty because other girls didn’t even have homes as nice as hers. That afternoon, Ellen went for a walk with Wire Dog. As they were walking along, Ellen noticed a tiny ant quickly making its way across the path in front of them. Ellen and Wire Dog both stopped to watch the little ant. So, Ellen and Wire Dog slowly followed the ant as it scrambled over rough parts in the way, around cracks in the dirt, over and under sticks and leaves along its route. Before long the ant came to a small hill where lots of other ants were also scurrying around. They were all busy doing something. Some were carrying bits of food or building material and some were just running here and there looking very occupied. Suddenly the little ant that Ellen and Wire Dog had been watching crawled into a hole near the top of the hill and disappeared. Ellen and Wire Dog both looked at each other. “Now what?” they both thought. Where did the little ant go? Was this his house? How far down into the ground did the tunnel go? Did he live down there? Did he have his own room or did he share a room with lots of other ants? Was there a kitchen or a bathroom down there? Was it a nice place to live or was it dark and creepy? Soon Wire Dog was ready to move on. He looked around to see if he could see something larger, like a bird or squirrel, but Ellen just kept starring at the ant hill, thinking about the little ant. She couldn’t help wondering if the ant liked his house. She wondered if some ants fix their houses up nicer than others. 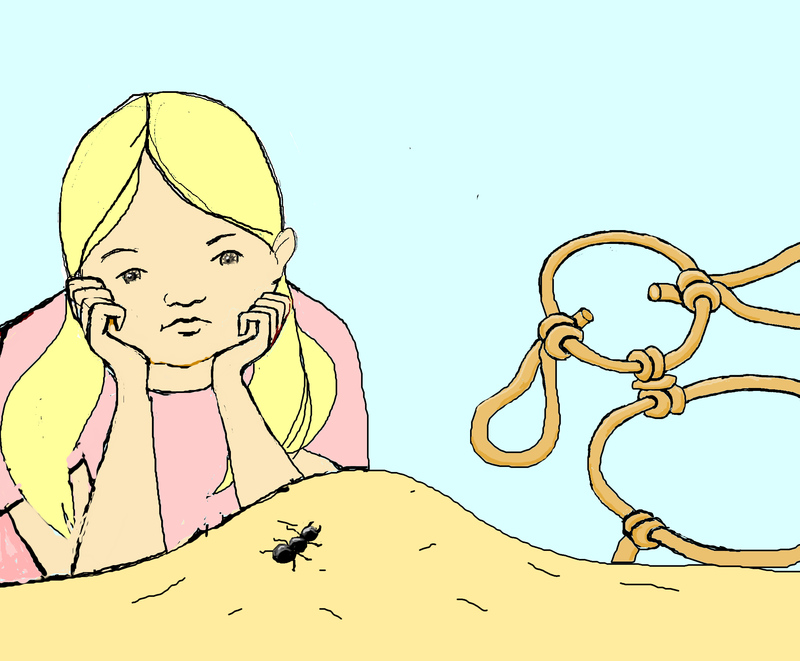 She wondered if the ant had a little part of the ant hill that he could call his own and fix up the way he wanted it. Finally Ellen could see that Wire Dog was anxious to go, so she took one last look at the ant hill and walked away. That night as Ellen washed her face, brushed her teeth and got ready for bed, she thought again about the little ant. She wondered if he was getting ready for bed too. When Ellen entered her bedroom, she looked out the window. It was dark outside and she thought again about the little ant somewhere down in the earth in his dark little home. Before Ellen crawled into her warm and comfortable bed she knelt down beside it and thanked her Heavenly Father that she lived in such a nice home. And then she also said a little prayer for the tiny ant she and Wire Dog had seen that day.